अक्टूबर डिलीवरी के लिए अनुबंध 0.84% या 42.00 रुपये नीचे 4950.00, रुपये पर कारोबार कर रहा था, इसकी 4992.00. रुपए के पिछले बंद से. अनुबंध के ओपन इंटरेस्ट एनसीडीईएक्स पर 9385 लोट पर खड़ा था. Turmeric futures pared off all the gains on Wednesday as speculators offloaded their positions, triggered by subdued locals and export demand. Further, latest reports from Spice Board of India indicated that the expected Turmeric exports for the period April-June 2011 have risen by 45% to 21,775 MT in 2011 from 15,000 MT in 2010 same period. The contract for October delivery was trading at Rs 4540.00, down by 1.69% or Rs 84.00 from its previous closing of Rs 4970.00. The open interest of the contract stood at 8300 lots on NCDEX. The contract for November delivery was trading at Rs 4950.00, down by 0.84% or Rs 42.00 from its previous closing of Rs 4992.00. The open interest of the contract stood at 9385 lots on NCDEX. Turmeric “the golden spice of life” is one of most essential spice used as an important ingredient in culinary all over the world. 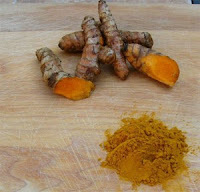 Turmeric, basically a tropical plant of ginger family is the rhizome or underground stem, with a rough, segmented skin. A yellow spice with a warm and mellow flavor, it is mildly aromatic and has scents of orange or ginger.